And next weekend, it’s C2E2 in Chicago! Wonder why we have a “Closed Till April 28” banner atop our website right now? 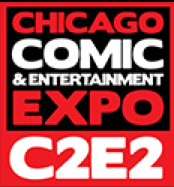 In addition to Spring Break vacation with my family and our aforementioned appearance at WonderCon this weekend, NEXT weekend, TwoMorrows will be exhibiting at the Chicago Comic & Entertainment Expo (or C2E2, as everyone’s calling it). We’re at Booth #708, with the same great 50% OFF sale at product debuts (Alter Ego #125, and American Comic Book Chronicles: 1965-69) as WonderCon. So if you’re not able to hit the West Coast, the Windy City’s just as nice. See you there?